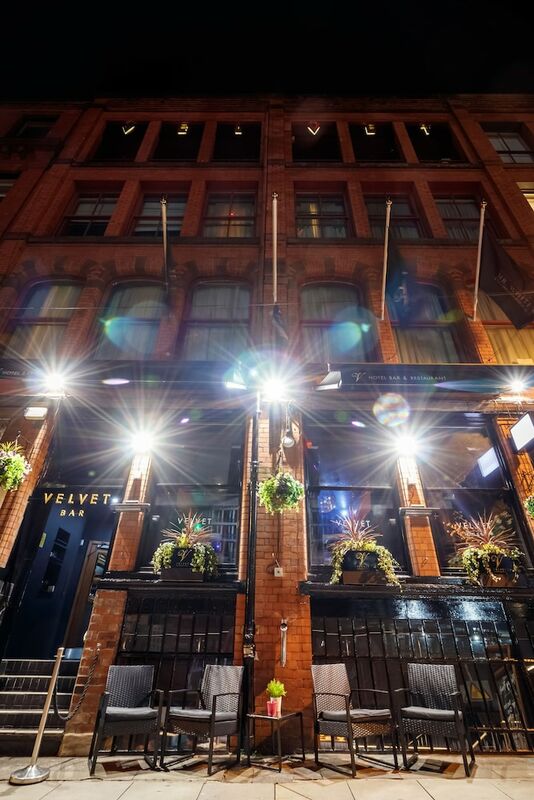 A stay at Velvet Hotel places you in the heart of Manchester, within a 10-minute drive of O2 Apollo Manchester and Royal Exchange Theatre. This 4-star hotel is 0.9 mi (1.4 km) from Manchester Opera House and 1 mi (1.7 km) from Museum of Science and Industry. Make yourself at home in one of the 19 individually decorated guestrooms, featuring iPod docking stations and minibars. Your pillowtop bed comes with Egyptian cotton sheets. 50-inch Smart televisions with digital programming provide entertainment, while complimentary wireless Internet access keeps you connected. Private bathrooms with bathtubs or showers feature complimentary toiletries and hair dryers. Enjoy British cuisine at Marco Pierre White, a restaurant where you can enjoy drinks at the bar and dine alfresco. Or stay in and take advantage of the room service (during limited hours). Cooked-to-order breakfasts are served on weekdays from 7:30 AM to 9:30 AM and on weekends from 8:30 AM to 10:30 AM for a fee.